There are three categories of teams. There is the group before the window that are teams that are building towards the goal but not quite there yet. As you advance through this category closer to the window, the teams get a little bit better and become greater immediate threats. Then you hit the second category of teams (this year's main cup favorites) that are in the window. Now, within this window there is also a ranking because the teams closer to the beginning of the window have a greater chance of staying there while those further down the list are at risk of falling out of the window. They would join the third class of teams, who either had been in the window and simply are waiting for some prospects to reload or just completely skipped over the window entirely after a group of prospects just didn't work out and are waiting to start over. If that was too much for you to read at once, here is a simpler version. The goal of the teams before the window is to gradually work their way into the window. The goal of the teams in the window is to contend for cups and stay there as long as possible. The goal of the teams past the window (though some of the teams that are just past the window still have a chance this year) is to get some prospects and work their way back into the group waiting to reach the window. So, according to their model the teams with the best shot this year are the Canucks, Flyers, and Caps while the Kings, Pens, and Hawks are better off in the long run. They think Oilers and Wild fans are going to have to wait longest for a winner while Boston, Nashville, and Phoenix are right on the brink of success. Thrashers: I'm putting this team on the right side of the window, but just barely. They do have a bit of promise with guys like Bogosian and Kane but they still have some work to do. Oilers: With two potential superstars in the system, the Oilers certainly are moving in the right direction but what they need to do now is to find them a supporting cast. Panthers: They are here not because of who they have on their team but who they have behind the front desk. Tallon has shown that he wants to steer this team in the right direction, and he is already off to a good start drafting Gudbranson. Islanders: John Tavares is a superstar coming into his own, and though the rest of the team is not yet up to par, he may keep them afloat (or at least from totally going under) until they get things together. Sabres: I like what I saw from this team in the regular season last year. Playoffs, not so much... That's ok though, as it shows there is lots of talent there and they just need to work out some kinks. Maple Leafs: Surprise. Some key offseason additions like Versteeg and Armstrong as well as the maturing of young guys like Luca Caputi will supplement "window players" (players who have reached peak of their career) like Phaneuf to make Toronto at least competitive this year. Predators: This team is actually moving a bit in the wrong direction, but I still think their future is still ahead of them. They better be careful they don't jump the window though. Blues: It's almost your time St Louis. This is a team that has obviously committed themselves to success in the near future (as seen by Halak trade) that believes that it's time is coming. Lightning: Silently building an offensive juggernaut behind Stamkos. This team can be good way sooner than anyone expects them to be. Coyotes: Phoenix is a team that found success not through superstar talent and blockbuster trades but rather through acquiring solid players and surrounding them with solid leadership. If they keep this up, they could find themselves in/near the window for a long time. Avalanche: Most people would say that I am putting them too high, but I really loved what I saw from this team in the playoffs last year and they were not too far away. If they could put it together this year, they have the potential to stay in the window for at least 3-5 years. PENGUINS: I'm sure I'm not the only Pens fan that is already starting to get nervous for those ominous years when Sid/Geno/etc contracts expire, but the truth is that that day is still quite a long way off. Until then, let's try to win a few cups. Capitals: Basically the same situation as the Pens, and (as much as it kills me to say it) it is only a matter of time before they figure it out in May. Bruins: Guys like Savard and Bergeron to lead the way now. Guys like Seguin and Lucic to lead the way later. What more can you ask? Kings: I guess even I am going to have to jump on the "Kings are a legitimate contender" bandwagon. They look to be primed for a deep run for the next few years. Red Wings: They have been about this place on the "window scale" for the last 5 years. They keep getting older, yet never show any signs of age. Why should this year be any different? Flyers: Didn't lose that much from last year (although they still don't have a goalie) so you can't count them out. Young talent like Van Riemsdyke and Leino should keep the rest of those hooligans on the map for a couple more years. Blackhawks: They got absolutely ripped apart after their cup last year, and almost need to start rebuilding again to find a supporting cast for Kane and Toews. Both of those guys currently at the top of their game should be enough to make this team a contender for at least a little while longer. Sharks: They are right on the borderline of the back of the window, so I will be generous and include them. The talent is still there, just getting older. Kovalchuks: Yeah, he's very good but it's nice to have a few other guys out there. It seems like guys like Parise are going to waste in that new system, and the loss of draft picks and cap space adds further to the chaos. Also, Marty isn't going to be around forever. Even though I have them outside, I'd say its now or never for this team. Senators: Veteran leadership is a very good thing. But is there such a concept as too much of a good thing? Yikes, they may need to start distributing HoverRounds as contract incentives. Canadiens: Was last year's playoff run a fluke? I guess we'll find out. Rangers: They seem like they are starting to get the right idea, but I wouldn't say they are "rebuilding" just yet. I would expect maybe one more down year before they start to slowly work their way back up to the top. It is there, but it will take time. Hurricanes: This team is tricky. I put them here really not so much because of their chances this year but their chances of being able to work their way into that "window." It won't take that long once they start rebuilding, it's just that they havn't really started yet. Blue Jackets: Well, at least Nash will put up monster stats again. 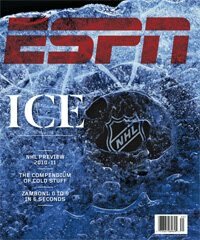 Ducks: I'm with ESPNMag on this one. They need a D before they could really get back to business. Flames: Bad trade after bad trade. They had their window a few years ago but were just unable to jump on it. Now it's time to take a step back and get back to building some pillars for a team. Stars: Ok, they have a couple good young guys but the rest of the team really is pretty average. It's not like they will be the worst team in the league anytime soon, its just that they seem like they are destined for mediocrity for quite a while. Wild: They had their window a few years ago and they totally skipped right over it. Whoops, back to the drawing board. So there you have it. It's not often that I really get inspired by an NHL piece done by ESPN, so I felt the need to post it.